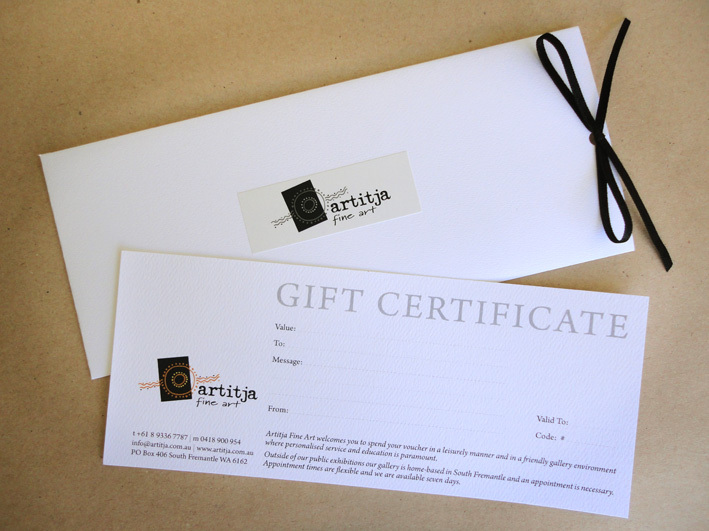 Artitja Fine Art GIFT CERTIFICATES are the perfect way to give a gift of fine art, and enable the receiver to choose their favourite piece. A GIFT CERTIFICATE is a great idea for those all-important occasions such as Birthdays, Engagements, Weddings and any celebratory or special event in peoples’ lives. It’s easy. All you need to do is either call us direct on +61 8 9336 7787, 0418 900 954 or email info@artitja.com.au. You can choose to purchase a GIFT CERTIFICATE by credit card (Visa, American Express or Mastercard), Direct Deposit or Paypal (upon issue of invoice) or by visiting us personally. Art is a beautiful, valuable, worthy and long lasting gift, which can be passed on from generation to generation.